« Meg Whitman guilty – of IRS fraud? Petraeus - war "for the rest of our lives"
“This is the kind of fight we’re in for the rest of our lives and probably our kids’ lives,” said Gen. David H. Petraeus, promoting an endless war in Afghanistan. In September 2009, Petraeus called a Washington Post columnist to say that the war would be unsuccessful if the president held back on troops. Because of this, General Petraeus was effectively banned by the administration from the Sunday talk shows. 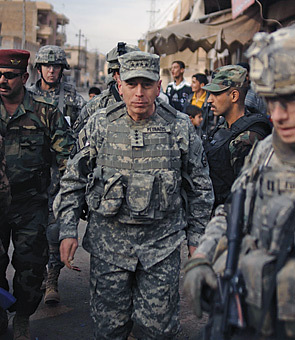 Still Petraeus did not obey the chain of command, but worked private channels with Congress and the news media to press his case for a protracted, if not endless, war. Obama had asked the military to give him three options on how to handle the war in Afghanistan. They gave Obama only one—calling for 40,000 new troops. It had irked Obama that Petraeus and Gen. Stanley A. McChrystal, then the top U.S. commander in Afghanistan, had been out campaigning for more troops on top of the 21,000 that Obama had approved shortly after taking office. To “prove his point” for an extended war in Afghanistan, Petraeus organized a classified war game exercise—code-named Poignant Vision to be held at the Pentagon on Oct. 14, 2009. Believing Petraeus had rigged the game, Lt. Gen. Douglas E. Lute, Obama’s representative from the National Security Council, boycotted it. Obama’s advisor, Adm Denis C. Blair also knew that the war game was designed to mislead the president. According to participants, Poignant Vision was nothing like a traditional war game, in which two teams square off. 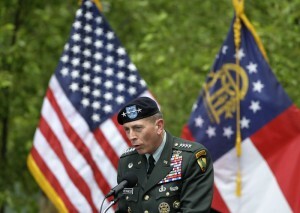 Poignant Vision was a four-hour seminar preaching the gospel of Petraeus. At the Nov. 11 meeting in which Obama expressed his frustration, Petraeus cited the war game as evidence that the Obama’s option for less expansion of the war and only 20,000 new troops would not work. Petraeus, and Secretary Gates both told Obama that his option would result in mission failure. Petraeus was not only insulting Obama by scamming him but going public with information which even more critical of the administration than that of McChrystal? So why doesn’t Obama do something about Petraeus?